Backpack and the FIFA World Cup! The 2014 FIFA World Cup is coming up (10 days, people! ), and most of us at Backpack are big fans. In fact, I did my senior thesis this past year on how the World Cup instills a sense of unity and comradery in people all over the world. Truly, football (a.k.a. soccer) is the game that brings the world together, as it is more widely followed around the world than any other sport, and the World Cup is the peak of FIFA's quest to instill those values. Recently, some of us at Backpack realized that Backpack's core values are similar to those endorsed by the World Cup. 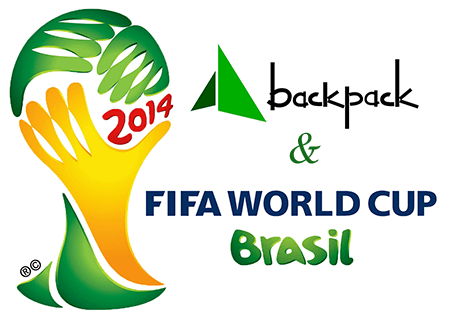 Like the World Cup, Backpack seeks to create a global community and bring it together. Both attempt to act as diplomats of a sort that enable a crossing of geographic and cultural boundaries. In short, both Backpack and the World Cup aim to bring out common desires and attitudes across cultures while providing everyone with a good time. Because they are similar in so many ways, Backpack wants to do SOMETHING having to do with the upcoming World Cup in Brazil. Whether it will be an ad campaign, a traveling featurette, or a series of interactive content is yet to be decided, but the wheels are definitely in motion. More to come soon.